ARM is considered the industry leader in developing intellectual property (IP) for small, cheap, and power-efficient processors. Its designs are licensed to partners who then manufacture custom-fit silicon, usually called system-on-chip (SoC), for the vast majority of smartphones and tablets that are available today. Apple, Samsung, Qualcomm, NVIDIA and Texas Instruments, to name but five, all use ARM technology in meaningful ways. SoC silicon integrates a number of different processors into one package. ARM's CPU architecture is prevalent in almost all customer designs, but partners are free to implement their own graphics processing units (GPUs), and Apple, in producing SoC chips for the iPhone and iPad, sides with graphics from Imagination Technologies, while Qualcomm and NVIDIA use in-house-designed Adreno and GeForce GPUs for the Snapdragon S4 and Tegra 3, respectively. ARM is acutely aware that the GPU element of future SoC chips is gaining in importance. Released in November 2010 and mooted to be first commercially used by Samsung in its upcoming Exynos 5250 SoC, ARM's Mali T-604 GPU, hewn from an all-new Midgard architecture, looks impressive on paper. It is based on a unified shader architecture and supports DX11, OpenGL ES, and, as we found out just recently, the Open CL 1.1 Full Profile, which is useful for GPGPU compute applications. Though the Mali T-604 is still a few months off from mass-market adoption from smartphone and tablet makers, ARM is today releasing three new Mali T-600-series GPUs, the T-624, T-628, and T-678. 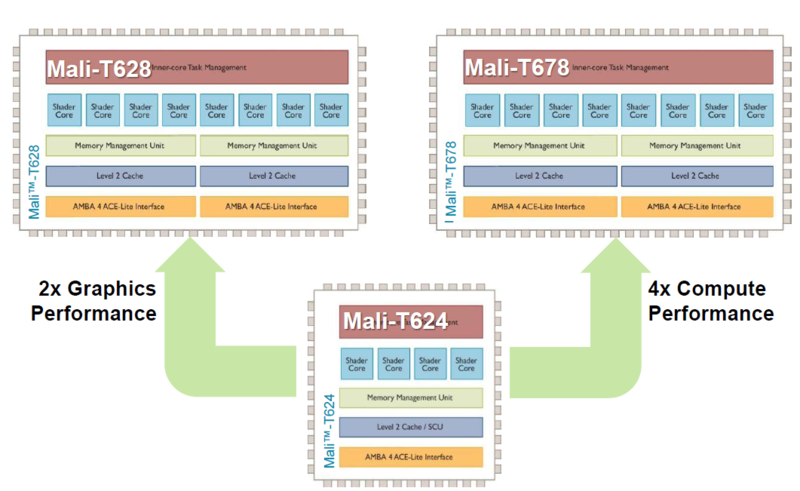 These second-generation Mali T-624 and T-678 GPUs follow the same basic topology as the incumbent four-core T-604 and eight-core T-658, insofar each core of the higher-specified GPU features double the arithmetic processing ability of the base Mali GPU. Architected for performance-hungry mobile devices such as tablets, do understand that T-658 and T-678 have up to double the cores, leading to up to 4x the compute performance. Mali T-658, meanwhile, simply doubles-up on T-624. So if the Mali T-604 and T-624 are so similar - and, remember, the T-604 is yet to arrive to market - why bother with a 'second-generation' architecture? Comparing like-for-like, Mali T-624 improves upon T-604 in two major ways. First off, ARM has taken a good look at T-604 and gone down to what is known as the register-transfer level (RTL), screening the GPU to see if it can remove any performance-related bottlenecks of the first-gen silicon. This is common practice after a chip has been released. General behind-the-scenes improvements enable the T-624 to achieve higher frequencies and better throughput than its predecessor, ARM says, though no hard-and-fast details have been provided. Secondly, T-624, and all second-gen Mali T-600-series GPUs, implement an ARM-developed feature called Adaptive Scalable Texture Compression (ASTC). Pushing lots of data around buses is wonderfully inefficient from a power standpoint, especially on mobile devices, and the reduction in memory traffic and footprint from using ASTC is key in improving device battery life and raising overall SoC efficiency. ARM says that ASTC has been adopted by the Khronos Group - the folks behind open-standard APIs - and will therefore be provided royalty-free to the developer community. It is expected that ARM's second-generation Mali T-600 GPUs will feature in commercial mobile devices in 2013. Building on solid technology from the established Mali line, the battle for mobile graphics is heating up nicely.